The Lighthouse Family series of books was among the first that I reviewed when I started my blog in August of 2008. As much as I loved the books, I reviewed them a bit reluctantly because they weren't all in paperback at the time and it seemed as though they might go out of print, even though Cynthia Rylant (Henry and Mudge, Mr Putter and Tabby, Missing May)is the winner of multiple Newbery and Caldecott awards and honors. However, I was THRILLED to see a copy of The Eagle show up on my cart of books to be shelved the other day and, after a quick check to make sure the series is still all in print and in paperback, I decided to re-post the review. Cynthia Rylant's experience and skill show in her series The Lighthouse Family Series. Despite being only 57 pages, a good number of which have illustrations, often full page, Rylant creates a detailed world, rich with images and vocabulary that is also gentle and slow paced. While these books all have exciting events in them, the suspense level is low and the quiet care and concern that the parental figures in the story provide is cozy and complete. Preston McDaniels' warm, cloud-like illustrations enrich the writing wonderfully. The Lighthouse Family series and the Catwings Quartet by Ursula le Guin make up two of the most imaginative, well written, beautifully illustrated sets of books written at this reading level (which is high first grade) that I have encountered. 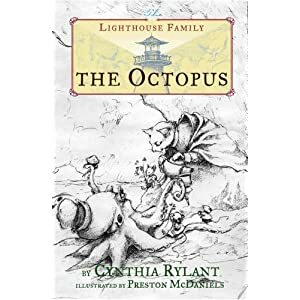 The Lighthouse Family is made up of Pandora, the lighthouse cat, Seabold, a sheep dog who washed ashore, and three orphaned mice children named Whistler, Lila and Baby Tiny and each book centers around a different creature that the family interacts with. These names may be difficult for some readers, as will some of the vocabulary (biscuit, tentacle, practicing, assumed) but it is writing like this that can stretch a reader's ability and imagination. And the writing is beautiful. At the start of the book The Octopus, the family is out in the garden where Whistler is making a bean trellis in the shape of a cat, which "delights Pandora." Baby Tiny is finally big enough to play in the garden, however, worried that a strong gust of wind might blow him away, Seabold ties him to the clothesline. Lila is making beetle houses out of piles of rocks and Pandora gathers herbs, walking through her garden with "an apron of mint." These books are a delight to read out loud and, with their gentle themes, make for perfect bedtime stories. Despite the reading level I gave the books, I think The Lighthouse Family series might be a struggle for a child who is not reading at a solid second grade reading level. And, I would hate to think of a young reader missing out on the beauty of the language and plot in these books while struggling with the vocabulary. I hope you will seek out these books to read to your children or for them to read on their own. Thanks for this recommendation. I tend to shy away from any books with talking animals (just a hangup of mine), but this sounds exactly right for my younger daughter. My daughter (age 4) adores these books, likes Cobble Street Cousins (though not as much) and is enjoying Catwings. Are there more books along these lines - short, heavily illustrated chapter books that are NOT readers with limited/controlled vocabulary? "The Squirrel's Birthday and Other Parties" and "Letters to Anyone and Everyone" by Toon Tellegen. Stories of forest animals with a Winnie-the-Pooh feel but not coy at all. Gorgeous books well worth the price in HC. Fabulous illustrations. Review will post in May. Big Susan by Elizabeth Orton Jones - A beautifully illustrated 88 page picture book about a girl and the family of dolls that inhabits her doll house. Written in the 50s and such a sweet, straightforward story. Again, worth the hardcover price. Probably the inspiration for Ann M Martin's excellent "Doll People" series which would be a great read out loud with your daughter. Hope this helps - please feel free to email me with amy more questions or suggestions! I did finally remember to compare the paperback illustrations (at the bookstore) with the hardcover artwork (copy I checked out form the library) and you as 100% accurate in your assessment. I am sad to realize this - the pictures, at their best, are very rich for a black and white illustration and the paperback versions are definitely lacking. Like you, I would shell out the extra $$ and buy the hardcovers since the pictures add so much to the story! These are so fantastic -- I've been enjoying reading them (repeatedly) with my son now, five years later. Thanks again for a stellar recommendation. Aw... That is SO good to know! Thanks for the update. I agree with you 100% and wish there were more. Don't forget Cynthia Rylant's POPPLETON series for emerging readers - another favorite of mine!